Frustrating traffic jams could become a thing of the past thanks to the humble ant. The planet's most intelligent insect is far more adept at managing congestion than humans, say scientists. This helps them move around their colony much more efficiently and why you never see the tiny creatures backed up in queues. Ants have brains that contain about 250,000 cells - the largest among insects, according to collective intelligence expert Dr Dirk Helbing. 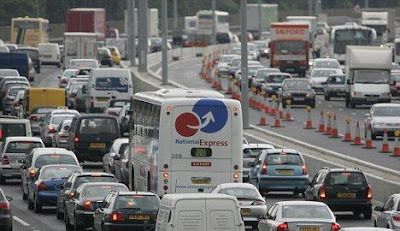 He believes his ant study could hold the key to solving the bane of road congestion. His team set up an 'ant motorway' with two routes of different widths from the nest to some sugar syrup. Unsurprisingly the narrower route soon became congested. But when an ant returning along the congested route to the nest collided with another ant just starting out, the returning ant pushed the newcomer onto the other path. However, if the returning ant had enjoyed a trouble-free journey it did not redirect the newcomer. 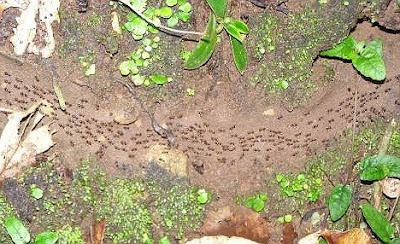 The result was that just before the shortest route became clogged the ants were diverted to another route and traffic jams never formed, according to New Scientist. A similar principle could be used if cars communicated with eachother, according to Dr Helbing, of the Dresden University of Technology in Germany. Cars travelling in one direction could remotely tell oncoming vehicles what traffic conditions they are about to encounter - so they could take evasive action if necessary.